Visual artist, poet and choreographer, Alex Cecchetti creates performances and unclassifiable objects that can take place in exhibitions or elsewhere. He draws his inspiration from literature, philosophy, science or music. Whether it’s a stand-up comedy about death, a walk backwards in botanical gardens or a visit to the Louvre without the Louvre, each of his works is a real experience shared by a community of spectators. His poetic and gestural language mysteriously brings the participants to embark on rituals or journeys where the perception and the great existential questions are brought into play. His works are meant to develop in the spectators their visionary qualities. For the past two years, he has been developing a narrative project of performances exhibition and a novel, as part of the project The Novel As Fantasy, edited by The Book Lovers and produced by the Ujazdowski Castle Center for Contemporary Art in Warsaw. There he has presented his personal exhibition Tamam Shud. He is the first artist to have benefited from a research residency at the Center of Contemporary Art at the Ferme du Buisson in 2016. In February 2017, he obtained a carte blanche at the Palais de Tokyo, in Paris, for a program entitled “Notte lusoria “. 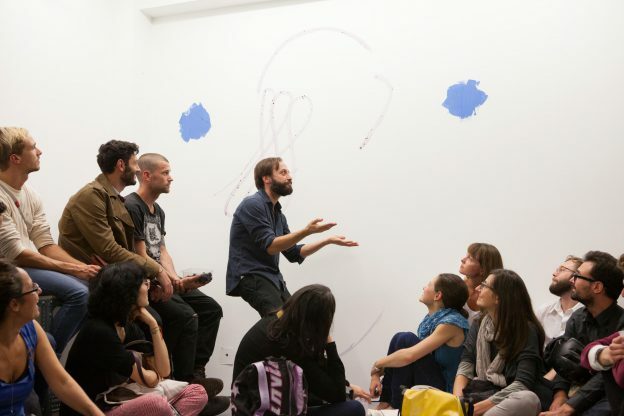 His performances and exhibitions have been presented in many institutions such as the Jeu de Paume, the Pompidou Center in Paris, the Serpentine Galleries in London, the Maxxi Museum of Contemporary Art in Rome, the Serralves Foundation in Porto, CAC Vilnius, M leuven or the foundation Sandretto Re Rebaudengo in Turin. Today La Ferme du Buisson hosts its largest monographic exhibition in France in collaboration with the CCA Warsaw. Next solo shows Spike Island, Bristol, UK in May 2018 and Void, Derry, Ireland in August 2018.